A federal judge on Tuesday reversed himself and rejected a bid by two former Acclarent Inc executives to quash subpoenas from a former employee accusing the company, now owned by Johnson & Johnson, of whistleblower retaliation. Maybe convicted former Johnson & Johnson Acclarent executives, William Facteau & Patrick Fabian, should have thought about self-incrimination BEFORE they committed healthcare fraud on behalf of Johnson & Johnson. 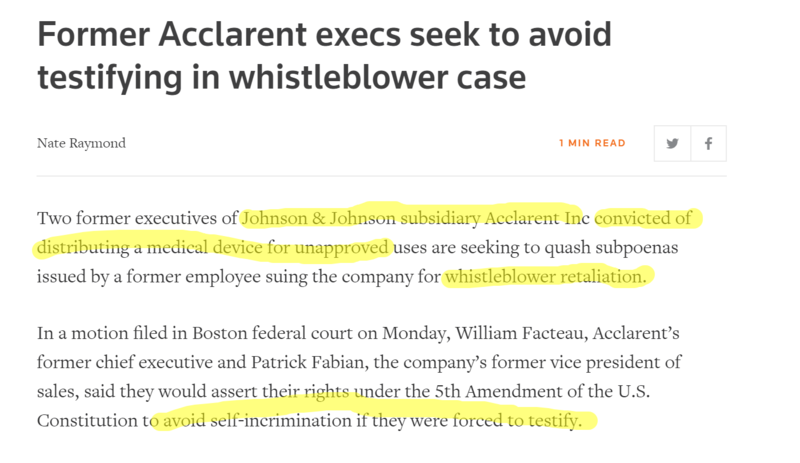 Keep in mind Johnson & Johnson’s (JNJ) Acclarent settled an $18 million civil fine to The Justice Department of the United States (DOJ) in July 2016, the same time former executives Facteau and Fabian were criminally & federally convicted of marketing & distributing a medical device, the Stratus Microflow Spacer, without FDA clearance. Facteau & Fabian have filed for a new trial. Criminals are abusively manipulating the First Amendment first to hide their criminal activity and second by trying to avoid being held accountable for their criminal activity at the expense of the whistleblower. Companies that pathologically employ tactics from The Sociopathic Business Model™ will continue to try and threaten, harass and intimidate whistleblowers as a means silence them. Johnson & Johnson is represented by white collar crime firm Covington & Burling LLP in the Acclarent whistleblower retaliation claim against myself, Melayna Lokosky. Johnson & Johnson’s, Ethicon’s Acclarent filed a motion to dismiss the whistleblower retaliation claims in 2017. The motion was denied however Johnson & Johnson who owns Ethicon & Acclarent got JNJ & Ethicon’s names removed from the case. Despite the fact Johnson & Johnson owns Acclarent and is paying attorneys Covington & Burling, the courts allowed JNJ to distance from the crimes they knowingly & willingly committed by removing the parent and subsidiary names from the Acclarent whistleblower retaliation case. 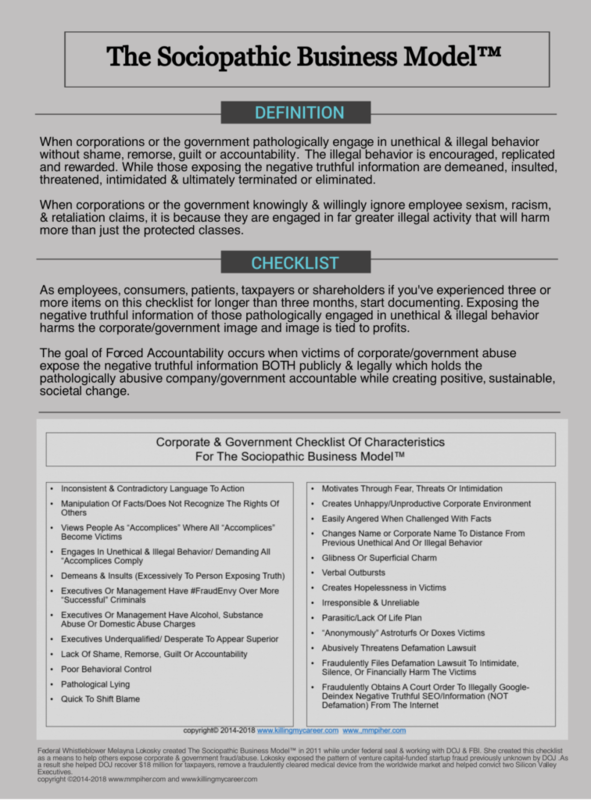 This is important for the public to understand and for the media to continue to attach all company names to the cases when reporting so that we can make educated decisions while holding the parent companies accountable. Removing the parent company name from a whistleblower claim is just another way abusive companies try to insult & demean the whistleblower. The company is also trying to diminish the importance to the case in the eyes of the public, media and more importantly juries. If a jury thinks the parent company just didn’t know what the subsidiary is doing, they’ll find the damages to be lower than if the company was complicit with the fraud. Johnson & Johnson was made aware of the fraud in March 2011 and knowingly & willingly chose to ignore the FDA’s request to do a clinical trial. JNJ continued to sell the fraudulent device until 2013 when the DOJ allowed them to pull it from the worldwide market as part of the deal made under seal in the original whistleblower complaint. In doing, Johnson & Johnson so they were complicit with the Acclarent fraud after the fact, which makes them no less guilty of fraud. Companies from automotive to medical device rarely do “voluntary recalls,” it’s usually just a deal being made behind closed doors with a government agency in a case that’s filed under seal. Johnson & Johnson cut a deal (or flipped on the executives) with DOJ. As part of that deal, Acclarent executives were kicked out from under the civil portion of the DOJ case and handed over for the criminal portion of the case resulting in Facteau and Fabian’s convictions. Johnson & Johnson attorneys at Covington & Burling caught retaliating against a whistleblower which the attorney admitted to during a deposition. Earlier this year, I was deposed by Covington & Burling attorney Michael Maya, paid for by Johnson & Johnson on behalf of Acclarent in my whistleblower retaliation claim against the company. During this deposition, Mr. Maya asked if I blocked attorneys from his firm from reading the website. I answered in the affirmative. Mr. Maya confirmed that his firm was on my website where I caught them mid-retaliation by rewriting the negative truthful SEO about Johnson & Johnson, which is again, retaliation. Some would argue that Covington & Burling should be named in a separate case for engaging in unethical and illegal behavior against a whistleblower. Facteau was CEO and Fabian VP of Sales at Acclarent which started out as venture capital-funded startup with few employees and easy access to executives. I was one of the first 50 sales reps out of eventually 250. 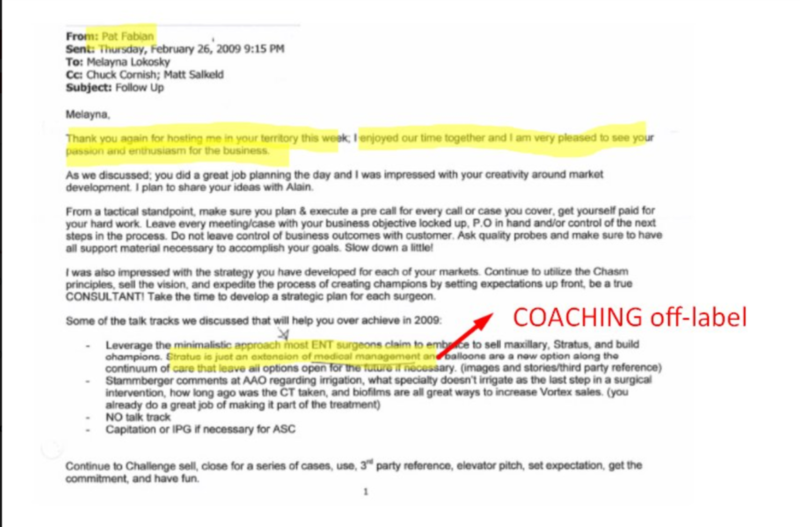 I interacted with both CEO & VP of sales regularly in person and through email and phone calls. My attorneys, Rory Delaney & Ilyas Rona subpoenaed both Facteau and Fabian to be deposed in my whistleblower retaliation case, which is what they’re currently fighting. Convicted criminals are arguing their rights to prevent self-incrimination are more important than a whistleblower’s rights for justice. This is dangerous precedent if the courts agree to allow them to exercise their First Amendment rights to avoid self-incrimination. The First Amendment cannot be used to protect illegal activity. They’ve been CONVICTED of illegal activity. The next hurdle of targeted harassment to overcome from abusive companies engaged in illegal behavior.